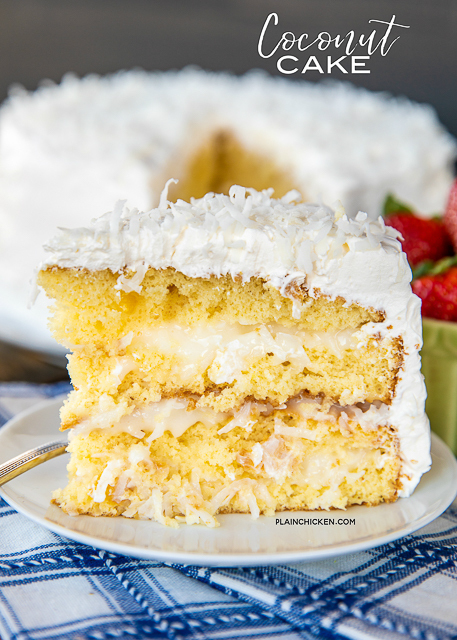 Coconut Cake - the sour cream cool whip frosting makes this cake! It is AMAZING!!! So easy to make and everyone loves it! This is my go-to cake for holidays and parties. Everyone always asks for the recipe! Only 5 ingredients -Cake mix, sour cream, cool whip, coconut and sugar. 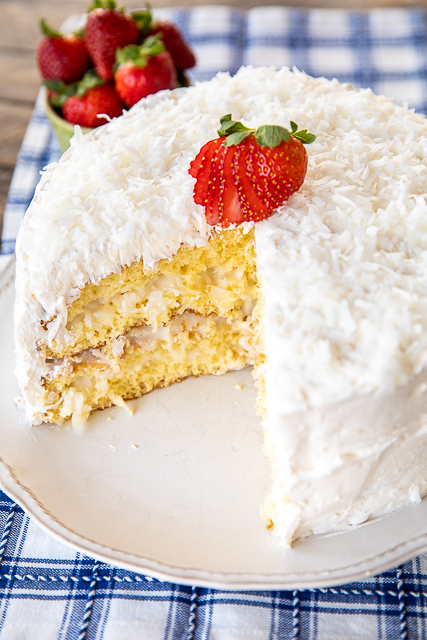 The frosting has to sit overnight in the refrigerator, so plan ahead to make this easy Coconut Cake! I got this Coconut Cake recipe from my Mom. She had it at a holiday party last year and asked for the recipe. OMG! I'm so glad she did! This Coconut Cake is so light and delicious. We ate WAY too much of this! It was totally worth it though. It is seriously one of the best cakes we've ever eaten. All you need is a few sliced strawberries and you are set! This is a great dessert for birthdays, cookouts, dinner parties, Easter, Christmas, Thanksgiving - really just any occasion that you need a dessert! This Coconut Cake is super easy to make. There are only a few simple ingredients - cake mix, sugar, sour cream, coconut and cool whip. The day before making the cake, you will want to make the frosting and let it sit in the refrigerator overnight. The frosting in made up of coconut, cool whip, sugar and sour cream. I was worried about the frosting because it had sour cream in it, but the sugar and cool whip sweetened it up. The frosting was obviously my favorite part of the whole cake! The cake layers are made from a box of yellow cake mix. You are going to split each baked layer into two layers giving the cake a total of four layers. Make sure to let the layers cool completely before slicing. 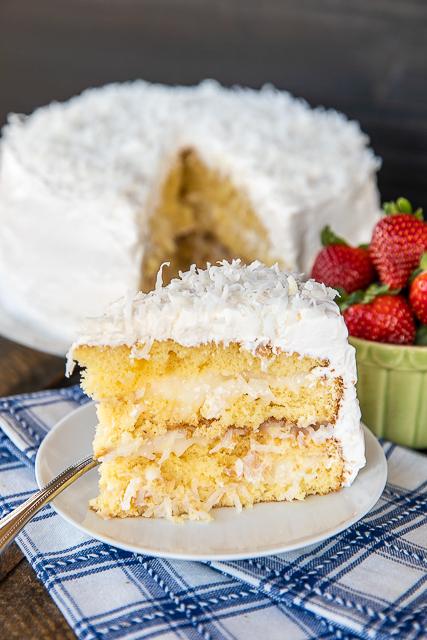 Once the cake is sliced, just frost with the coconut frosting. This is a very simple cake to make, it just requires a little planning. The actual hands on time is minimal. I used full fat cool whip and full fat sour cream in the frosting. I figure, go big or go home! I haven't tried this with reduced-fat or fat-free ingredients. If you try it, let us know how it turns out. You can make the cake a day in advance and store it refrigerated in an air-tight container. The cake needs to be refrigerated because of the frosting. It will go bad if it isn't refrigerated. 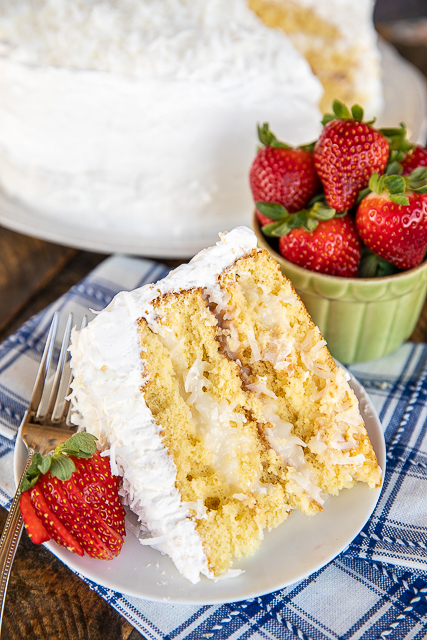 This cake is perfect for parties, potlucks, holidays and Mother's Day. We served the cake with some fresh strawberries. Perfection! Can I Freeze Coconut Cake? I love to make the cake layers ahead of time and freeze them for a quick dessert later. I bake the cakes, cool and slice them before wrapping them in plastic wrap and putting in freezer bags. I take the layers out of the freezer when I make the sour cream/coconut mixture. The cake is thawed by the time I am ready to frost the cake. I haven't frozen this particular cake frosted. It didn't last long enough to freeze. Typically, it is just fine to freeze cakes. You will want to put the cake in the freezer and once it has frozen wrap it tightly with freezer plastic wrap. I also like to put it in a freezer ziplock bag. You don't want any air to get on the cake in the freezer. The cake should last several months frozen. Slow Cooker Taco Chicken Chicken - a weeknight family favorite!! Only 6 ingredients! Chicken, cream cheese, cream of chicken soup, chicken broth, taco seasoning and Rotel diced tomatoes and green chiles. Serve over Mexican rice and black beans, pasta, grits, rice or potatoes. Everyone cleaned their plate and asked for seconds! That never happens!!! This recipe is a keeper! 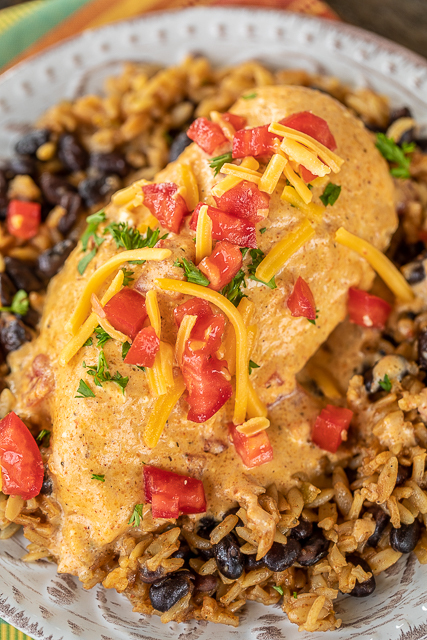 The BEST Slow Cooker Mexican Chicken! One of my favorite weeknight recipes is Slow Cooker Angel Chicken. It is delicious! I decided to jazz the original recipe up for Cinco de Mayo. OMG! 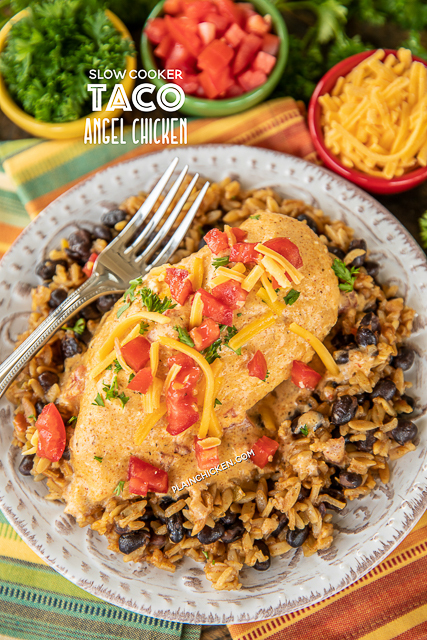 I might like this Slow Cooker Taco Angel Chicken better than the original! Seriously delicious! I love easy slow cooker recipes like this - just dump everything in the slow cooker and dinner is done when you get home! Give this a try ASAP! I promise it will be a hit! Traditionally Angel Chicken is served over angel hair pasta. That is how it gets its name. I decided to serve this Slow Cooker Taco Angel Chicken over some Mexican rice and black beans. We loved it! Don't let that yummy sauce go to waste. Spoon it over the chicken! If you don't want to serve this chicken over rice, it would also be great over the traditional angel hair pasta or even mashed potatoes. We loved this Slow Cooker Taco Angel Chicken. It is super simple to make and it tastes great. Place the chicken in bottom of the slow cooker insert. Next, heat the cream of chicken soup, taco seasoning, Rotel diced tomatoes and green chiles, cream cheese and chicken broth in a saucepan over medium heat. This is just to incorporate the cream cheese so you don't have clumps of cream cheese in the finished dish. 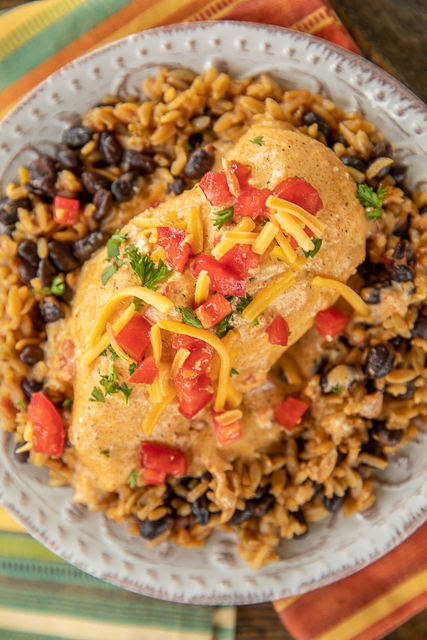 This Slow Cooker Taco Angel Chicken uses a can of diced tomatoes and green chiles. If you are worried about the heat, make sure to grab a can of mild diced tomatoes and green chiles. We didn't find this spicy, but I know everyone is different. Meow Monday - pictures of cute cats to start the week! 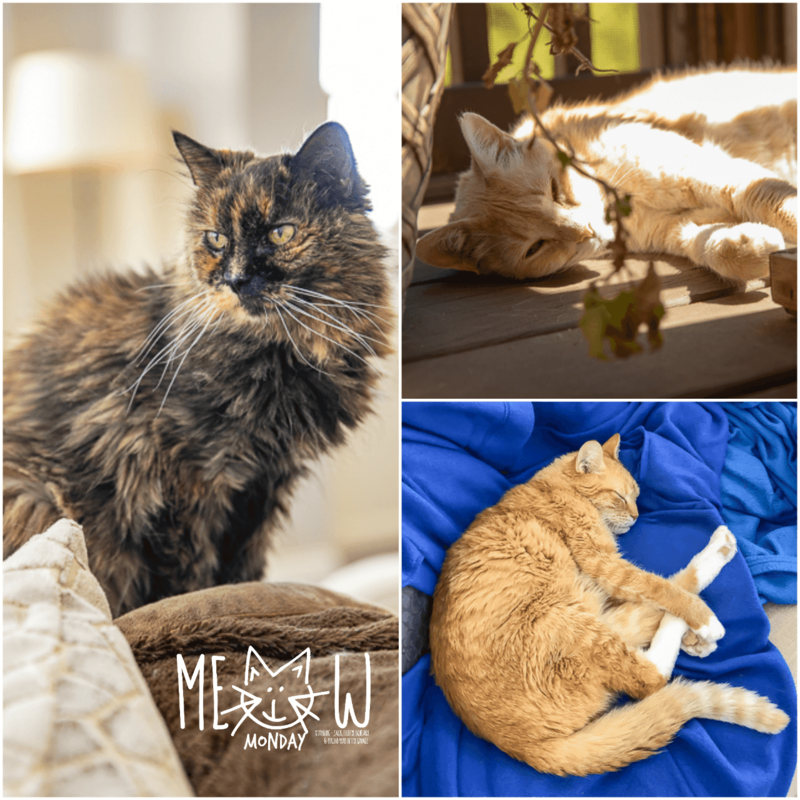 Come see what Jack, Squeaky, and Nacho Man Kitty Savage have been up to! Good Morning! I hope everyone had a great Easter holiday. The cats spent the day napping and begging for ham. They are looking forward to bites of leftover ham all week! Me too, kitties! Me too! It is supposed to warm up this week and feel like summer. I know the cats are going to be outside all week! The hotter the better for them! We had a cold spell last week. It totally confused the cats. It was warm one day and freezing the next. They are all definitely ready for the warmer weather. I hope you have a PURRFECT week!